Think Obama should be tougher? Then think about Nixon. 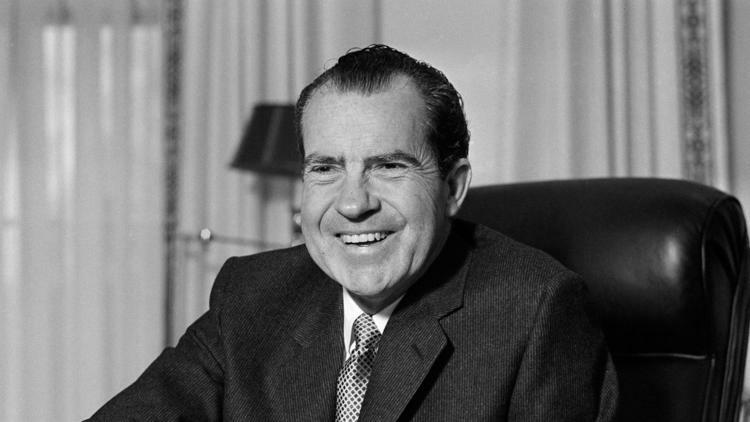 Those who fault President Obama for not being belligerent enough toward Russia and Iran — or assertive enough in dealing with the crises in Iraq, Gaza, Syria and Afghanistan — would do well to remember how poorly the feckless bravado of President Nixon served us and our allies in Vietnam. Once Nixon became president and was faced with the daunting task of forcing the North Vietnamese to negotiate — even as U.S. forces withdrew from Vietnam and U.S. antiwar sentiment peaked — he began trying to “scare the hell out of everybody” to gain leverage against Hanoi. His calculated displays of rashness included invading Cambodia, making a jaw-dropping opening to China and initiating the “Christmas bombing” of Hanoi in late 1972. That last bit of butchery was designed to shock and awe the North Vietnamese into finally signing off on the Paris peace accords negotiated by Henry Kissinger. But it was also designed to get President Nguyen Van Thieu of South Vietnam to line up behind the accords, despite his suspicions that Kissinger had sold him out by allowing North Vietnamese troops to stay in the South. After the agreement was implemented in January 1973, the U.S. withdrew its last combat forces from Vietnam and Congress began shutting down aid to our Saigon allies and throwing up legal obstacles to renewed U.S. military support for them. But as my old intelligence colleague Merle Pribbenow discovered from reviewing Hanoi’s war archives, the North Vietnamese didn’t seem to believe the congressional constraints would work with Nixon. Out of concern that the “madman” or his acolytes might defy them, they kept secret sapper units on high alert outside U.S. air bases in Thailand up until the last day of the war, in case they were needed to thwart a resumption of the U.S. air war. In Saigon, the new U.S. ambassador, Graham Martin, kept South Vietnam’s Thieu similarly befuddled. Nixon had handpicked Martin precisely because he saw him as an extension of his own smoke-and-mirrors machismo — “the next best thing to a B-52,” as we described him at the embassy. Martin understood there would be no B-52s again thanks to congressional action, but he convinced Thieu that if worse came to worst, the madman would find a way. For the embattled South Vietnamese president, such assurances became a rationale for resisting reform. Rather than address the corruption that kept his political adversaries pacified, Thieu indulged sycophants and profiteers who were destroying his capacity to fight, and held fast to the assumption that America’s imperial president would come to his rescue if necessary. Immediately the North Vietnamese began ratcheting up pressure to test Gerald Ford. In early 1975, they seized a provincial capital, their first such prize since 1972. Both sides waited to see how the U.S. would react. When no airstrikes materialized, CIA intelligence sources began reporting that Hanoi was preparing to make a lightning strike for total victory. Thieu began scrambling, belatedly, to rid himself of deadwood commanders and redeploy his resources to meet the coming onslaught. But it was too late. By early April 1975, communist regulars had obliterated his entire American-made army. The road to Saigon was open. Inside the embassy, Martin could not bring himself to face the reality that lurked behind all the posturing he had perpetrated. The bully had been blinded by the bluff. Until the bitter end, he remained convinced that America’s own deft political hand could rescue a fig-leaf victory from defeat. On the last day of the war, he still hadn’t planned adequately for the evacuation of American civilians and our most imperiled Vietnamese allies. As we approach the 40th anniversary of Nixon’s resignation on Aug. 9, 1974, one of the lessons to be drawn from his Vietnam policies is that clear-eyed acknowledgment of our limits is ultimately better for our allies and for us than the momentary satisfaction of pretending there are no limits at all. Posted on August 7, 2014 by Administrator. This entry was posted in Exclusives, News, Vietnam War and tagged Barack Obama, Central Intelligence Agency, Commentary, Hanoi (Vietnam), Ho Chi Minh City (Vietnam), Opinion, Vietnam. Bookmark the permalink.